The Music Cabinet returns this Saturday! The latest episode of The Music Cabinet podcast is now live and here are pics of some of the selections featured. Thanks for listening! RENDEZVOUS Podcast Number 2...Coming Soon! This past weekend, most of the RENDEZVOUS crew stopped by my house and we recorded our second podcast. We also had a special guest stop by...David Gregory from Severin Films! It was a fun hang, full of laughs, drinking, and conversations about music and film. I’m currently editing the podcast and it’s looking like it’s going to run about 2 hours in length (same as our first one). Tony Giles, from The Damn Fine Network (DFN), kindly asked me if we’d like to have it hosted on the DFN and we were like “Hell yeah! !” Keep your eyes here and on our social media accounts for an update on the release date. Next RENDEZVOUS Party...THE SADIST OF NOTRE DAME! Next month on Friday the 13th of April, we (RENDEZVOUS) will be screening Jess Franco's THE SADIST OF NOTRE DAME (also known as L'eventreur de Notre-Dame, Demoniac, Sexorcismes, etc.) at the Hyperion Tavern is Silverlake. Severin Films have restored the film to beautiful blu-ray specs and have included loads of special features. 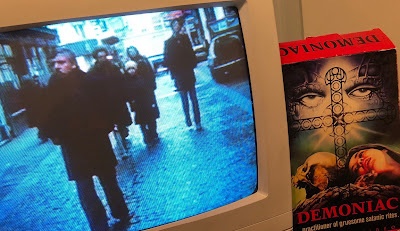 Above is a pic of the Wizard Video big box VHS of DEMONIAC. Join us on the 13th for a FREE screening! The Music Cabinet is Now Open!! Hey friends... So sorry for the LONG absence. I've neglected my blog here for quite a while (a little over a year! ), but the good news is I'm back!! In case you haven't heard, I am working with the good folks at The Damn Fine Network and have created a monthly podcast called The Music Cabinet (named after this blog, of course). Below are my first five episodes beginning with the most recent one. Hope you enjoy! 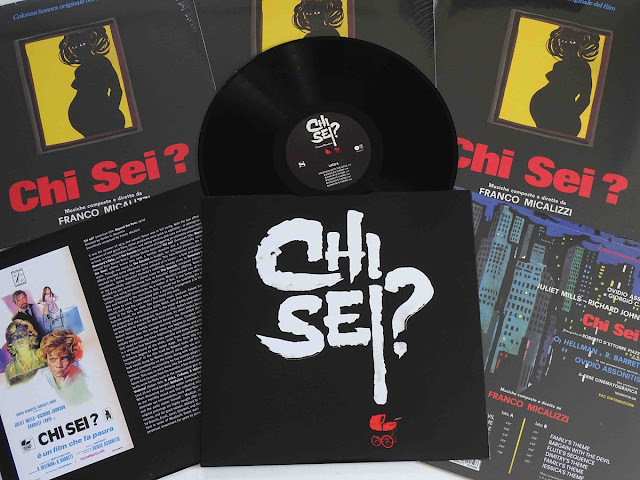 Hey friends, be sure to grab a copy of Franco Micalizzi's amazing score to the 1974 possession shocker (and Exorcist/Rosemary's Baby rip-off) 'Chi sei?'! Thank you to my friends at Four Flies Records for asking me to write the liner notes for this one...it was a true honor. It's available NOW through our friends at Two Headed Dog Music!